UPDATE: Effective October 2018 the Sub-User feature has been discontinued and is no longer available for creating new sub-users. If you had been using this feature previously, you're grandfathered. If you would like to have additional users added to your account, please check out JotForm Enterprise. There are several ways to Share Forms. You can share them using the Direct Link, you can clone them, or you can grab them from our Templates Gallery. But what if you want to maintain control over the form that is shared? This where sharing a form by adding someone as a Sub-Account user will be beneficial. Step 1: Go to your ACCOUNT'S USERS page. Step 2: Click the CREATE NEW SUB USER button. Step 3: Enter the email address of the user with whom you wish to share your form(s). 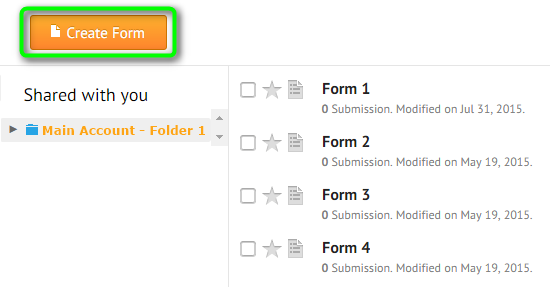 Step 4: Select the folder or forms you want to share and click the CREATE button. It will then tell you that an invitation email has been sent. 🔘 To share all the forms in your account, select SHARE ALL FORMS. 🔘 To share a particular form, choose SELECT FROM MY FORMS. For both options you can set the privilege to either VIEW SUBMISSIONS or EDIT FORMS (or both). 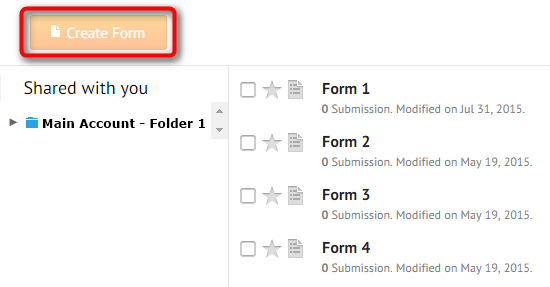 Step 5: If those with whom you are sharing the form(s) don't have a JotForm account, they will need to sign up first. They will then be able to log in to JotForm to view the shared forms as a Sub-User of the Main Account. Step 6: If they already have a JotForm account, then all they need to do is login to their account. 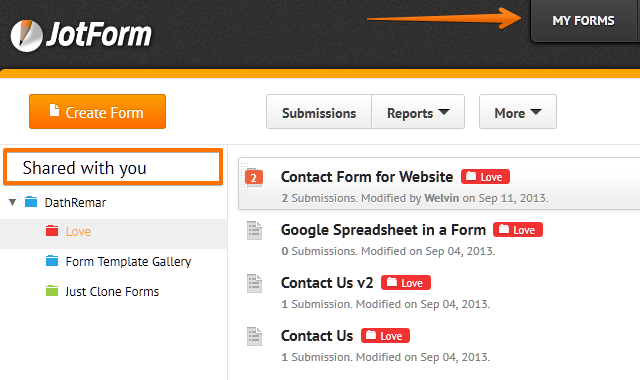 Step 7: Now that the forms have been shared, the newly added Sub-User should login and go to the MY FORMS page. Step 8: They will see the shared form(s) by clicking the SHARED WITH YOU menu on the left nav. NOTE: User Accounts which are created as Sub-User (Child) of a Main Account (Parent) can not create forms on their own account unless they already had an existing account that has other forms created prior to being added. Once an account has been assigned as a Sub-User, the MY FORMS menu on the left nav is hidden from view by default leaving only the SHARED WITH YOU menu displayed. If a Sub-User wants to create forms, then they must first click on the Assigned Folder of the Main Account (Parent) so that it is activated. Then, he'd be able to create a form inside that Folder. If you wish to remove a Sub-User, just go back to your Account's Users page, select the user, then click the DELETE USER button. Additionally, please also note that there is a limit in the number of Sub-Users you can add. It depends on the Pricing Plan you have for your main account. You user list will display the maximum number of Sub-User accounts you can add. Is it possible to increase the number of submissions available for a sub-user. We have a 'Gold' account, which allows for 100,000 submissions, but sub-users are only allowed 100. I reviewed the JotForm Enterprise addition and the cost is ridiculous and outrageous for small facilities who just need to add 1 or 2 users in order to access submissions securely. Because of this, we may now have to look for a different vendor, which is quite disappointing. I have a sub-user that creates her forms inside Share wth me folder but now she has a warning message "You're out of upload space limit. Upgrade Now." Is there any limit in uploading files for sub-users beyond the principal uploading limits that in our case is up to 1 TB? Is there a limit to the number of submssions a sub account can have? I have a handful of forms that were shared with me before that person left the company. I want to share those already shared forms with a new employee. How can I share the shared forms? My organization has an upgraded jotform account and has me as a sub-user so I am able to see their shared folders. So my question is, am I able to use my 1 invitation to invite a co-worker to be a sub-user under me and would they be able to see the parent directory of my organization? We have forms with hidden fields that we do NOT include in the notifications either. How can we give a sub account access to the submissions, but only select fields (like HIPAA data) and keep the entries hidden so only select users can view those columns across all entries? I'm creating a form for a totally non-tech friend. I will want my friend to a) be able to fill in the form b) produce the .xls file for all times she fills in the form. WHICH METHOD OF SHARING SHALL I USE TO ACCOMPLISH THESE TWO TASKS? Thank you. I am trying to share my account with our music minister but he can't seem to create any new forms.....what do we need to do? If I share a form with a sub user can they then clone that form and use the clone as their own form, non-linked to my account so that all submissions come to their account and not mine? Is there no way that I can make sub users and that they have an upgraded plan, but not everyone personally, 1 pack. I’m now silver maybe there is more an business pack? Regrettably, I just looked and the information on the number of subaccounts permitted under each plan is no longer readily available on the pricing page of Jotform's website. Why should this be kept secret from someone who is trying to make an informed decision about which account type to choose? Your Plans and Pricing matrix leaves a lot of questions about the actual Feature set of each plan! The four columns hit the highlights. But, when you click on the column, you should be taken to a page that lists a lot more detail and explanation of the complete feature and benefits package of each plan, especially since you don't offer phone support! Clicking the individual plan columns only takes you to the same pricing/order pop-up as the "Upgrade" button. I had to write for additional information about a plan I was considering, and was told about the number of sub-accounts that were allowed with one of them. Nowhere on your Plan page does it mention sub-accounts! What else are we not knowing about your paid services??? What are the maximum amount of sub-user accounts possible for each plan? I it possible for sub-accounts to receive specific submissions ONLY? I don't want sub-account users to be able to access all submissions from a certain form. How can I make the sub account user the owner of the form? I have created a sub-user for Vossler at utk dot edu and she created a form but I cannot see it in "My Forms". There is no mention of sub user limits on the pricing guide. Nevertheless, having a Silver plan I now find myself with too many sub users. Under the Account Tab > Users, instead of simply allowing us to create new users and delete existing users we should be able to edit users already present and replace them with new users (simply by editing the email). There should also be a button to resend the auto-message notifying an individual that they have been granted access to see a JotForm. Is it possible to make it so that way I am the only person who can share the link of my form? What I want is that even people who access the form, that the link it will not work for them when they try to share it. Is that possible? Are the sub accounts required to have their own pricing plan or can they be operated for free? I want to create a DEVELOPMENT sub account and a PRODUCTION sub account. The PRODUCTION account will allow users to do everything EXCEPT EDIT FORMs. How do I do this with no errors? Hi. This option is very good. It is possible to prevent the sub - users to delete information already received ? I really just want them to view , but do not want them to delete. Thank you for your awesome support. Hi, Can sub-users have different paypal accounts on the forms they edit? (I'm assuming since they can edit/clone shared forms then they can edit the paypal account to which payment is sent in their own version of a form, but I just want to check). I just want to verify first before we purchase a Subscription with you. If ever we are sharing form/s with Sub-users, is there a way for those sub-users to view the submissions of those forms coming from the respondents? We really need this to be working.. Thank you and I am hoping for your prompt response. I thought I created my own account and built a page, but turns out I was logged in as a sub-user - so now the person I work with on other projects has access to my personal page (and gets notices when each of the forms arrives). Is there a way to change this page so the form is only owned (and viewed) by me? Good Afternoon, I've tried adding a sub account for a new user and he never got the e-mail invitation to see my shared forms. I have him clearing his caches and browser history. What do we need to do in order for him to see the shared forms? Thanks! Is it possible to delete my shared forms letting them in control of a sub account? Or they will delete from sub account all toghether? Is there a way to limit the capabilities of the sub-user accounts, so that they are not able to create new forms? I am a sub-user and I was wondering. Can I save forms I make to the shared folder? Also, if I can do that does it mean that those forms are subject to the limitations of the paid account or of my free sub-user account? I have done all the points however the ‘Shared with you’ tab does not appear on the sub accounts? That is for edit or view. How can I make some forms submitted to different email? I was shared some forms with master account. However, I don't have the shared with you tab on my left and nothing appears in my account. Can you help me on that? Hello, I added a sub account and everything went well until we got to step 7. At my sub-account´s profile, there is no a "Share with you" option. Instead appears the regular menu to create forms. I will appreciate your help with this situation. How can my other users create forms from scratch? Can I create a form and have multiple users fill out different sections of the same form? Is there a way for a subuser to create a form that the primary user does not have access to?